Since I was too busy lovin it up yesterday to post this I guess we could call this an Outfit Of Yesterday but that doesn’t have a cute little acronym, so it’s just not happening. Anyways, yesterday my wonderful partner Nightrider and I spent a lovely Valentine’s Day together. We spent a majority of the day lazing around, cuddling on the couch, watching reruns of Tabatha’s Salon Takeover and finally around 6pm got cleaned up and dressed up for our night out on the town. 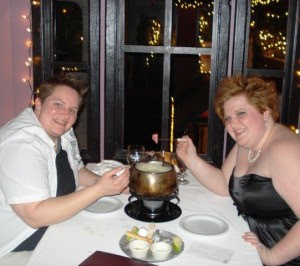 We planned a dinner at a local fondue restaurant, one of the more fancy shmancy eateries in Boise. Since we were going someplace nice I decided to pull out my best little black dress that I have only worn one other time but absolutely LOVE! This great black satin bubble hem dress came from Torrid and is a size 18. It fits like a glove and luckily enough fits very tightly and structured in the bust so I was able to go sans bra for the evening (I hate a strapless bra so this is a WIN!) I paired it with black and white plaid size 8 peep-toe pumps that were from Torrid as well. I do have to tell you that these are the most comfortable heels I have ever owned. I took this simple but classic look and added a pearl necklace and earring set that I got as a gift from my mother before she got married last year. 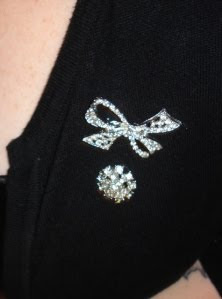 Since it was a bit cold out, for the time in the car I wore a simple black cardigan and added on two sparkling rhinestone pendants that came with another Torrid dress I own. This cardigan looked nice but did tone down the whole look. It served it’s function though keeping me warm enough outside but it came right off once we got to the restaurant. Nightrider had reserved us a private table in what the restaurant referred to as “Lover’s Lane” and we had a great night with a four course fondue meal that left me feeling as fancy as I looked. Overall a great Valentine’s date with a great look!